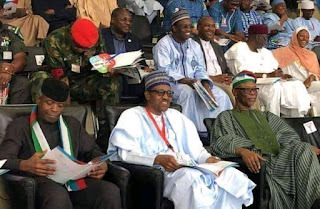 The national convention of the ruling All Progressives Congress APC has changed its slogan from ‘Change’ to ‘Progress’ following an announcement by one of the Master of Ceremonies that the delegates should no longer chorus ‘change’ anytime the name of the party is chanted. “I want to announce that when shout APC, the appropriate response should now be Progress and not Change”, he announced. Articles 4 of the APC Constitution as amended lists ‘Change’ as the slogan of the party. That section of the party constitution has not been amended. Adams Oshiomhole and his wife arrive at the Convention Also the All Progressives Congress National Convention has affirmed former Governor Adams Oshiohmole as the National Chairman.